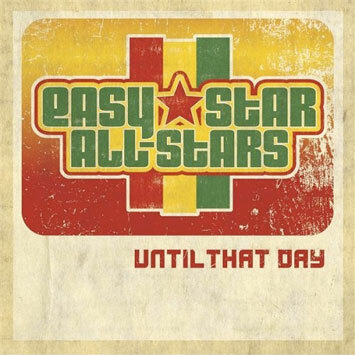 While everyone is waiting to find out what will be the next classic album to get the Easy Star cover treatment, we are very happy to announce the release of UNTIL THAT DAY, an EP of original Easy Star All-Star songs. The EP will be a digital only release initially or you ca pick up a copy at any Easy Star All-Star live show. Once more reason to catch them live. Last bit of news: the brand new Easy Star All-Stars EP will be available soon (see the cover below). UNTIL THAT DAY features 5 original songs--often heard in the band's live sets--and 1 unreleased dub version of "Climbing Up The Walls" from Radiodread. It will be available exclusively through iTunes February 26 and available digitally everywhere else (including here) on March 11. You will also be able to buy a physical version here or on the road at Easy Star All-Stars shows. Look for more info on this soon.